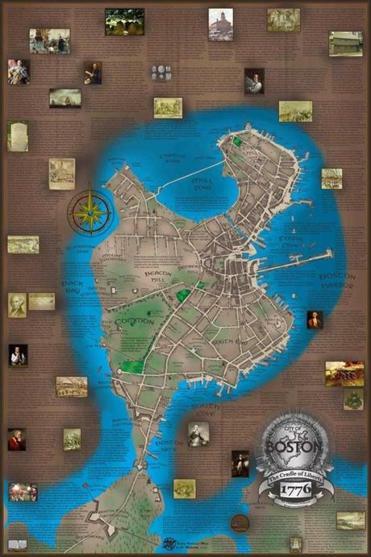 Charlestown is seen in a map by Ed McCarthy. T he pool table in Ed McCarthy’s Westwood basement is a beauty. It’s an antique, with leather mesh pockets and a thick slate bed. It serves as the centerpiece of the room, which also features walls crammed with memorabilia and a bar with two kegs on tap. The billiard table, McCarthy likes to note, was salvaged from an old pool hall that was once located in Codman Square, where his Irish immigrant grandparents made their home. It’s the kind of local history he quaffs like a pint of his beloved Guinness. “Those are my favorite pieces of information — the stuff the old townies know that’s not in any of the books,” says the amateur historian, who works the graveyard shift as an emergency medical technician in the city. For several years now, McCarthy, 47, a father of three, has combined his love of local lore with his talent for drawing: He’s been making a series of oversized, fanatically detailed maps of the city and its neighborhoods at various points over Boston’s past four centuries. The product of countless hours of research and design, McCarthy’s maps are more than a mere hobby. “I burn a lot of shoe leather,” he says, visiting various historical societies, state archives, the map center at the Boston Public Library, and other research institutions. More than that, though, he makes firsthand surveys of the city’s crooked, story-laden streets while on the job as an EMT. Ed McCarthy is seen with his maps in his basement. 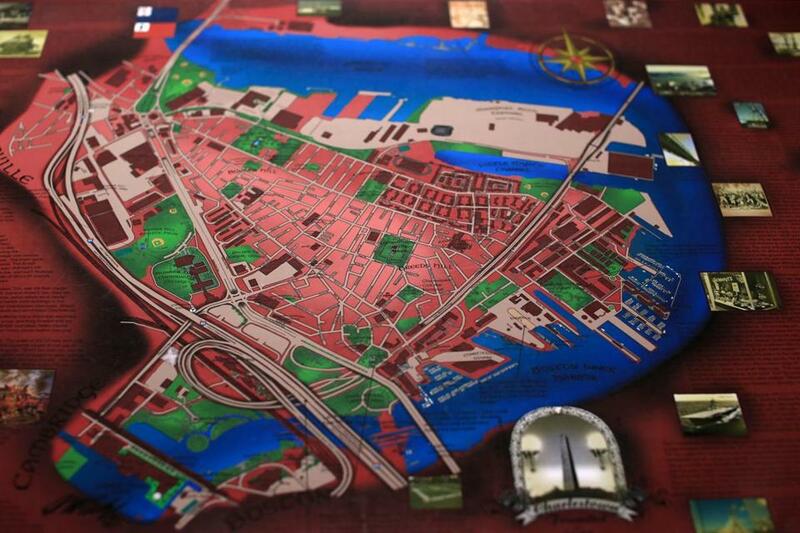 For several years now, longtime Boston EMT Ed McCarthy has been making a series of oversized, fanatically detailed maps of Boston and its neighborhoods. Here are a few examples of McCarthy’s work. “I drive my partners crazy,” he says, asking them to turn down side streets and alleyways in the ambulance during down times, which he whiles away with a sketch pad on his knee. Amused and impressed, O’Connor told McCarthy he was welcome to use any information he could glean from O’Connor’s work. 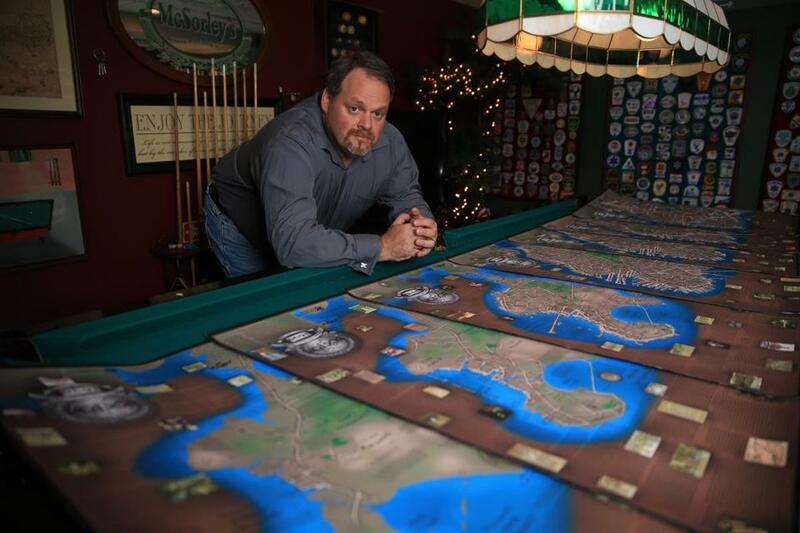 In the McCarthy basement on a recent gloomy Saturday afternoon, the self-taught cartographer carefully lays his maps on the pool table for a visitor to examine. The core seven feature Boston as it appeared at pivotal times in its history, from its founding in 1630 when it was little more than a spit of land to its “Cradle of Liberty” period in 1776 to a major US city of 2010. 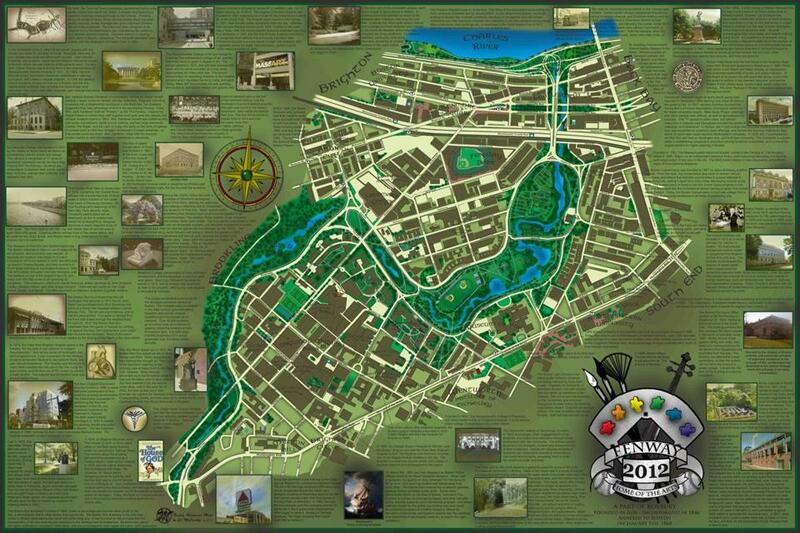 Other maps zoom in on neighborhoods — Jamaica Plain, Roxbury (the “Mother of Towns”), Southie. There are two versions of that one: one with a section about Whitey Bulger and another “Whitey-free” edition. The wide margins of the color-coded maps are dense with insets and tales from the city’s past. Each map is marked by a cartouche of McCarthy’s own design — an emblem he created using clip art, freehand sketches, and a scanned image of one of his mother’s brooches. To date, McCarthy has completed 23 maps of his intended 55. He hopes to see them hanging one day in City Hall or in civic buildings, bars, hotels, and “places with waiting rooms.” He says he’s sold about 130 prints so far at $100 a pop, mostly to friends and co-workers and by word of mouth. A few have earned places of honor in homes as far away as Florida and Mexico City. “We have other historical maps, but these two are definitely my favorites,” says Jason Turgeon, an environmental scientist who blogs about the history of his neighborhood and belongs to the Roxbury Historical Society. He has two of McCarthy’s Roxbury maps hanging in his Fort Hill home. Oddly, given the exacting nature and massive scale of McCarthy’s pastime project, he doesn’t come across as especially obsessive. He does allow that his son sometimes jokes he must be “in the Illuminati,” what with all those meetings he takes to trade arcane information. After some initial skepticism over the time his project was taking, his wife threw her support behind it when she realized McCarthy was bringing home some extra cash. “I’m not going to give you [grief] about being on the computer anymore,” she said, laughing. Though he’s still building his website (www.historicalboston.com) with the help of his ambulance partner (who is also named Ed), McCarthy says he knew he was onto something from the very beginning. When a co-worker wanted to buy a copy of the Southie map, McCarthy put it in a dinged-up thrift-shop frame (“I fixed it with a Sharpie”) and brought it to Beth Israel, where he’d arranged to meet the man. He laid the map on an empty bed in the emergency room and went off to track down the buyer. When he returned, he found a half-dozen doctors and nurses oohing and aahing over his map. Two of them asked to buy copies for themselves. For McCarthy, Boston’s back story isn’t just a thing of the past.